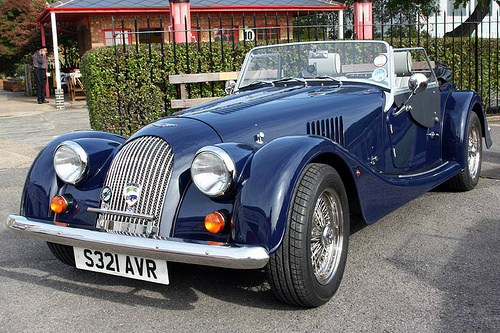 The Morgan Plus 4 sports car was finally discontinued in January 1969 after a production run of over eighteen years. In the meantime, the model might have been out of sight, but certainly not out of mind. Consequently, in October 1985, it was reintroduced under the designation Plus Four Twin Cam. It was now powered by a Fiat 2 litre, 4-cylinder, fuel injected engine, linked to a Fiat five speed gearbox. It was offered as both two and four seater variants, and fitted with 15 inch Cobra-style wire wheels. As a result, in order to accommodate these stylish wheels, wider wings were required. It developed 122 bhp at 5300 rpm, and 127 ft/lbs of torque at 3500 rpm, giving it a top speed of 112 mph. Between October 1985 and May 1988, a total of 144 units of this model were built. In May 1988, another variant was introduced, designated the Plus 4 M16. In this model, the Fiat engine was replaced by a Rover 2 litre. 16 valve, fuel injected, M16 engine, with a compression ratio of 10:1, and linked to a Rover five speed gearbox. This engine increased output to 140 bhp at 6000 rpm, and 131 ft/lbs of torque, giving it a top speed of 109 mph. Since the performance of this model was almost on a par with that of the Plus 8, this ensured a positive response from the market. In 1991, this model now used the same wider chassis as the Plus 8, and was fitted with a catalytic converter. By the time this variant was discontinued in December 1992, 357 units had been built. In December 1992, the M16 engine was replaced by the more reliable Rover 2 litre, T16 engine, but still linked to the Rover five speed gearbox. It was now designated the Plus 4 T16 sports car, and was still offered as both a two and four seater. In May 1993, the brakes were now servo assisted. Finally, in 1994, this model was fitted with the modified Rover R380 gearbox. Sadly, in 2000, Rover decided to no longer supply their T16 engine, with the result that Morgan had little choice but to cease production of the Plus 4. However, its demise was to be short lived and, for the second time in its history, it was reintroduced into the market in 2004. The performance of this new model was quite impressive, with output of 145 bhp at 6000 rpm, and a top speed of 118 mph. At the launch, it was offered only as a two seater but, two years later, the four seater variant was introduced. This model certainly gave the Plus 8 a run for its money! 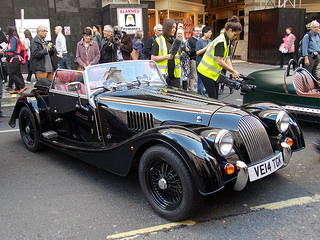 The final early to mid 90's Morgan Plus 4 could command a price of between £20,000/$30,000 and £25,000/$40,000.